This might sound like scaremongering, but plans are afoot to charge both two and four-wheeled vehicles of a certain age to drive in London, and if it’s not stopped now then this policy will certainly extend around the UK to other towns and cities. Transport for London (TfL) have created the ULEZ (Ultra Low Emissions Zone) and proposals for this include charging motorcyclists £12.50 per day to use roads within the boundary of the North and South circular roads in London. And if you don’t live in or rarely travel through London don’t think this won’t affect you, because of course not only is this ULEZ concept designed to cut air-pollution in the capital, but daily charge and subsequent fines will raise an awful lot of money for TfL and we all know how much local councils love a revenue raising scheme! It won’t surprise you therefore to learn that up to 28 other local authorities are apparently also looking into creating Clean Air Zones around the country. The central London ULEZ scheme will come into operation in April 2019 and from then on powered two-wheelers, cars and small vans will all be charged £12.50 per day to use roads in central London. Already TfL have unfairly decided to charge bikes and scooters the same 4-wheelers. TfL are then proposing that from 25 October 2021 this will cover an expanded area roughly up to but not including the North and South Circular roads as indicated on the map below, effectively making the whole of inner London an Ultra Low Emissions Zone. When the expanded ULEZ comes into force all motorcycles and scooters registered before 1 July 2007 will have to pay the daily charge which, knowing governments, is likely to have risen by then from the £12.50 per day they plan to start with. The charge will apply 24 hours a day, seven days a week. Exemption from the ULEZ will be given to all vehicles that have a ‘historic’ vehicle tax class or are registered prior to 1 January 1973. Unlike the VED itself, this exemption is unlikely to be rolling because it relates to vehicles built before emissions standards came into force rather than those simply being 40 years old. 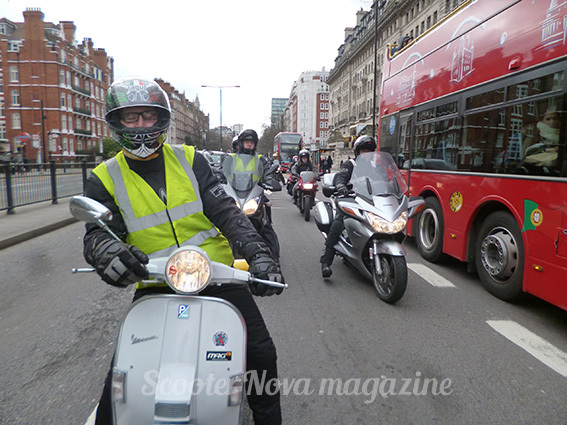 In the world of classic scooters this will mean no SIL Lambretta whatsoever will be allowed, nor any API Lambys, Serveta Jet 200s, later 150 Specials or Lynx Lambrettas, Vespa Rally 200s, many smallframes from 50 Specials to Primaveras, 150 Supers, all T5s, PX200, Cosas, or pre-2007 PX125 and 150s, among other classic models. The consultation period for the ULEZ proposals began on 30 November 2017 and closes on 28 February 2018. By taking part in it you have a chance to fight for an exemption for all powered two-wheelers, both in London and elsewhere for the future. Motorcycle parking in London – far fewer cars (driven with one person in each!) would occupy the same space on the street, thus reducing congestion. For the 2019 introduction, there will be a short ‘grace’ or ‘sunset’ period until 25 October 2021 that will give residents within the central ULEZ zone time to change their vehicle, during which those who register will be allowed a 100% discount. Commuters who live outside the zone and rely on a pre-2007 bike or scooter to get to work on will not qualify for any discount. They must either pay up or try to squeeze themselves onto an overcrowded and expensive train or bus. Penalty charges for non-payment of the ULEZ charges for non-compliant cars, vans and motorcycles will be £130, although the consultation paper also asks to increase this to £160. One flaw we consider the consultation paper to have is that it is all about ‘Light Vehicles’ which, as far as TfL are concerned, includes diesel and petrol cars, vans, minibuses and similar vehicles along with motorcycles, scooters and mopeds. As far as we are concerned, powered two-wheelers should be treated separately. Bikes and scooters don’t cause traffic jams or sit in them, we filter past stationary 4-wheelers. You can fit up to seven bikes or scooters in the space of one large car on the road with regards to both parking and travelling; yet you rarely see a car in London with more than one person in it, let alone seven. Reducing congestion and keeping traffic moving is surely a great way to reduce pollution? Older bikes and scooters may produce more emissions than newer models, but it’s still less than a car with one person sitting in it going nowhere. When I left school all those years ago I travelled from zone 5 on the London Underground to zone 1 for work. I soon gave up on the train and rode my Vespa PX daily instead, which was a quicker journey than public transport into London’s West End. Today an annual travel card ticket for that journey would cost me £2328.00, or £6.38 a day if I worked 365 days per year! (The most expensive annual tickets are £3548 to Zone 9, £3568 to Watford or is £4232 out to Shenfield in Essex!). However, using my 1998 Vespa PX to ride the 30 miles or so per day would cost maybe £3 per day on fuel and oil, £37 pa for VED and even if insurance was £200 per year that still only totals £1332 for commuting 365 days per year – almost half the price of a train for a faster commute AND I get to keep my scooter at the end of the year. Again, the link to the consultation paper is here and we think it’s important that all riders, all over the UK complete it. It only takes 5 or 10 minutes, you don’t have to give any personal details if you don’t want to and it could help get all powered two-wheelers onto various transport strategy agendas in the future. Be sure to add positive comments too about the benefits of riding scooters, both old and new, in the relevant box at the end. You can pre-order, buy and subscribe online here!
. Visit http://www.scooternova.com for details. This entry was posted in Lambretta, Piaggio, Scomadi, scooter, Vespa and tagged area, bike, bus, charge, classic, Commute, congestion charge, consultation, GTS, lambretta, london, London Transport, mag, map, Mayor, moped, motorbike, motorcycle, north circular, parking, Powered Two Wheeler, proposal, ptw, riding, scooter, scootering, south circular, suzuki, TFL, train, Transport for london, ulez, Ultra Low Emissions Zone, Vespa, vintage, West End, yamaha, zone by admin. Bookmark the permalink. It seems ludicrous to charge powered 2 wheelers on the same level as 4 wheeled vehicles. Congestion and traffic jams must be one of the major contributing factors to air pollution. So not only do 2 wheelers create less air pollution than 4 wheelers, just based on engine size but also that 2 wheelers don’t cause congestion. If everyone traveling through a major city was on 2 wheels then there wouldn’t be any congestion or traffic jams. You should be promoting the use of 2 wheels rather than penalising it. All motorcycle, scooter and moped riders are invited to come to London on 21st April to make the point that “Motorcycles Matter”. Motorcycles play an important role in our congested cities. The problem is that the people running things don’t get it. Transport for London (TfL) and the Mayor of London refuse to acknowledge this. It’s not just London: there are another 28 authorities around the country looking into Clean Air Zones (CAZ) and charging vehicles for entering them. In London it will cost £12.50 a day to pass the North and South Circular into central London. Your Local Authority should be doing more to make it safe to park your bike by supplying more motorcycle parking bays with security. Manufacturers should be doing more to build in better security. Insurance companies should not be punishing the owners. The government should be doing more to support the Police in their fight against theft and increasing the penalties so that owners are not financially punished due to increased premiums. We are not a ‘cash cow’ to bolster failing finances due to government cutbacks. So it’s time for motorcyclists to hit the road for a “Motorcycles Matter” awareness ride! Keep an eye on social media for updates on this event. Bumps built on the road to slow traffic are now being taken away due to creating extra pollution on that spot, stationary traffic is the biggest problem and cars with driver only inside. Busy Cities in the world have already realised this like India etc. Living in Oxford I have ridden a bicycle for 40 yrs, now I no longer have the pedal power so I use a motor scooter, my bicycle with me on it is much higher and longer than my scooter and the width is the same as my shoulders on both yet I carry a passenger. I have not been held up by any traffic with my little scooter so any measured distance through London or Oxford with a fitted pollution gauge would be abysmal for any mileage covered compared to any other motorised vehicles. Petition or no, it will happen. The whole world will go electric soon enough.